This past week, we've witnessed a confluence of events that may have profound effects on our lives as both investors and consumers. What started out as a rumor last week was promptly verified only a few days later: PLDT, parent company of number one mobile company, Smart, entered a deal for a controlling stake in Digitel, operator of strong-third mobile player, Sun. The move has raised more than a few questions about how the competitive landscape of the mobile telecommunications industry will be affected, and what it all means for investors and the general public, alike. This post aims to answer some of these questions by taking a closer look at the PLDT - Digitel - JG Summit "megadeal." PLDT agrees to pay for these assets, priced at 69.2 billion pesos, with new PLDT shares at a conversion rate of 2,500 pesos worth of assets to 1 new PLDT share. Just by looking at these details, a typical investor would not be able to readily answer questions that are relevant to him (like how much is PLDT paying for each share of Digitel, or how much premium JG Summit will receive from the sale?). This is what I meant when I said the involved parties have not been sufficiently forthcoming with the details of the deal, and overseeing bodies have not been able to exert enough muscle to ensure the required transparency. However, as it turns out, most of the information we need to answer these questions are actually available, although we do have to dig a bit deeper. For many of the items in the discussion below, you would have to refer to Digitel's latest quarterly report for September 2010 found here. While one aspect of the equity portion of the deal (item 1 above) is straightforward enough (51.55% of Digitel owned by JG Summit), what's missing is how much PLDT values this stake (how much it is worth to the firm) and how much PLDT is willing to pay for it. In similar deals in more developed markets with stricter regulatory requirements, like say, in the US, this piece of information, the offer price, is readily provided to the general public. This piece of information is important to all investors because it doesn't only affect the shares sold by Party A to Buyer X, but also the value of shares held by other parties B, C, D, etc. even if they are not directly involved in the transaction. By packaging this deal as a basket of assets with one price, outsiders are not able to attribute implied premiums to any one component asset. The second asset (item 2 above) are zero-coupon convertible bonds previously issued by Digitel and owned by parent company JG Summit. We know what bonds are, but what the hell are "zero-coupon convertible bonds"? "Zero-coupon" means just that, issuers are not required to pay periodic interest or coupon payments and holders earn exclusively from capital gains. In this case, the issuer, Digitel, receives a certain amount from the bondholder, JG Summit; Digitel is then obliged to pay JG Summit a significantly higher amount when the bonds are redeemed at some later date, up to when the bonds mature. If you take a look at Digitel's 3rd Quarter Report, you'll find this item on the firm's balance sheet (page 17) as "bonds payable" worth 15.8 billion pesos on September 2010; details of the bonds may be found in Note 13 (pages 52 to 53). According to PLDT, these bonds would have a face value of 18.6 billion on June 30, 2011, although based on my estimate, it should just be 17.2 billion pesos. This discrepancy will prove very significant in assessing the value of the transaction to all parties involved, which I will discuss in the next part of this post. Another possible source of confusion for less experienced investors would be the convertible feature of the bonds. These convertible bonds give bondholders (now exclusively PLDT) the right, but not the obligation, to exchange the bonds for shares of the issuer, Digitel, at a specified rate, in this case 1 new share of Digitel for every 1 peso of face value of the bond. This option, in itself, is a valuable asset since it allows the holder to acquire Digitel shares at a much lower price than what is dictated by the market. One way to estimate the value of this asset would be to determine how much it will save the bondholder if it exercises its right to convert the bonds. When the bondholder converts the bond (since in this case, PLDT most certainly will), the ownership of all shareholders prior to conversion will be diluted by the newly issued shares, and the total value of shareholdings prior to conversion may change depending on price paid for the option. 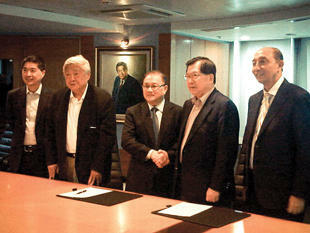 Finally, the deal includes advances made by JG Summit to Digitel worth 34.1 billion pesos (item 3). This is Digitel's liability (and JG Summit's asset) which you'll find, again, on the firm's September 2010 balance sheet as a noncurrent liability "due to related parties" worth 34.29 billion pesos. Details could be found in Note 17 on page 55. Now that we better understand the assets involved in the transaction, we are in a better position to answer some of the questions we posed at the beginning of this post. Unfortunately, this has gotten too long so soon, so I would have to continue the analysis in Part 2, where we'll look at who ends up with how much, and possible implications to your stock investment strategy and cellphone bill.